In April 2013 an event of major historical importance took place in the Gambia, West Africa – the renunciation of communities and circumcisers in Wassu, Central River Region, of the practice of Female Genital Mutilation (FGM), to which over two-thirds of the Gambian female populace are routinely subjected from infancy into adulthood. 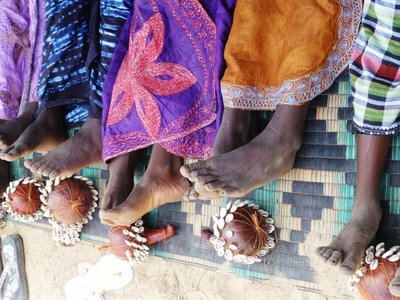 There is as yet no law in the Gambia to outlaw a practice that affects up to two-thirds of women in the country, but the NGO, GAMCOTRAP (Gambia Committee on Traditional Practices Affecting the Health of Women and Children) has, since the 1980s, been engaged in the struggle to eliminate FGM. At GAMCOTRAP’s fourth ‘Dropping of the Knife’ Ceremony young girls who would routinely have undergone FGM dress up in the finery normally associated with the occasion, and shed their shoes, only to celebrate a new form of adulthood in which their fundamental rights to bodily integrity are preserved.